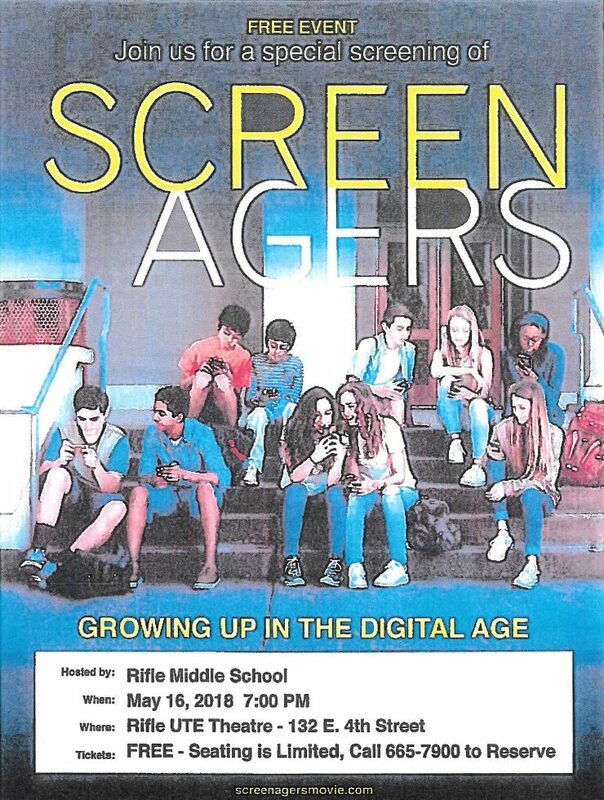 Rifle Middle School hosts award-winning “Screenagers: Growing Up In The Digital Age.” Are you watching kids scroll through life, with their rapid-fire thumbs and a six-second attention span? Physician and filmmaker Delaney Ruston saw that with her own kids and learned the average kid spends 6.5 hours a day looking at screens She wondered about the impact of all this time and about the friction occurring in homes ans schools around negotiating screen time. Ms. Ruston created the film “Screenagers” to explore the messy struggles of navigating the digital world and offer solutions. If you are a parent with questions about the impact of technology on your child’s development, you won’t want to miss this film! It is free of charge; however seating at the Ute Theater is limited so reserve your spot by calling 970-665-7900. The film is appropriate for children age 11 and up to attend with parents.